The social network revealed that one of its services rocketed higher in the second quarter, pushing "MOMO" stock steeply higher. 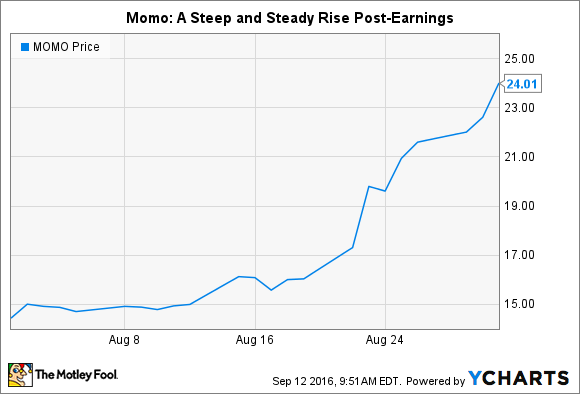 Stock in Momo Inc. (NASDAQ:MOMO) coasted on an enormous wave of buying interest and rose 66.3% in August, according to data provided by S&P Global Market Intelligence. The Chinese mobile-based social networking platform posted second-quarter 2016 results which completely upended expectations. Revenue spiked 222% to $99.0 million, and earnings more than quadrupled to $15.4 million. Driving the top- and bottom-line propulsion? A tripling of revenue in the company's live video service, to $57.9 million. Only recently introduced in the third quarter of 2015, the service allows users to broadcast video live to other Momo users, and has already attracted 1.3 million paying customers as of the end of last quarter. To put its growth into perspective, live video revenue in Q2 2016 was roughly equal to Momo's total revenue in the first half of 2015. The live-video success appears to have changed management's mind on an extremely important issue to the company. CEO Yan Tang, together with an investor group, notified the company's board in August that they were withdrawing a yearlong effort to take the company private. This action should help management focus on the monetization of social video broadcasting. This spring, the company placed video services on its own separate tab within the Momo app, and management has promised more integration of video with the Momo social experience -- centered around the millennial dating scene in China -- in the coming "Momo 7.0" app upgrade. Investors should understand that while Momo's new revenue stream has significantly pushed year-to-date profits forward, it may take a few additional quarters of results before accurate margins for the service can be gauged. While Momo hasn't broken out segment costs for live video, total "costs and expenses" increased 177% last quarter. According to management, these were pushed higher by video-related costs, including revenue sharing with broadcasters, production costs for "Momo Live" shows, and marketing and promotional expenses to attract new users. For the moment, investors are more interested in the dynamic revenue potential of Momo's app than in getting a fine reading on its profitability, and admittedly, it's hard to ignore such growth in a company which booked sales last year of just $134 million. Still, those keen to buy Momo should know that the type of chart-breaking performance exhibited in August is often followed by heightened volatility.